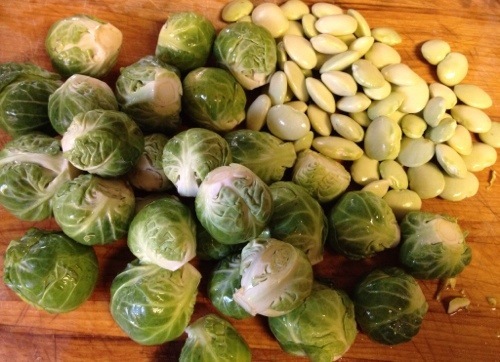 Brussels sprouts and lima beans, the two vegetables that make most of America groan and kids run to hide. We are so accustomed to steamed, over-cooked, stinky, frozen Brussels sprouts and dried or frozen lima beans cooked until they are bland and mushy. But once you have tasted these vegetable prepared fresh, in manners that highlight their sweetness, the reaction changes. In my house, it is a happy day when fresh versions of either of these vegetables appear. Putting the two together in one dish makes for a very happy day indeed. My lima beans had finished producing, so the produce came from the farms at the University of Pennsylvania farmers market. The garlic, as always, came from my garden. 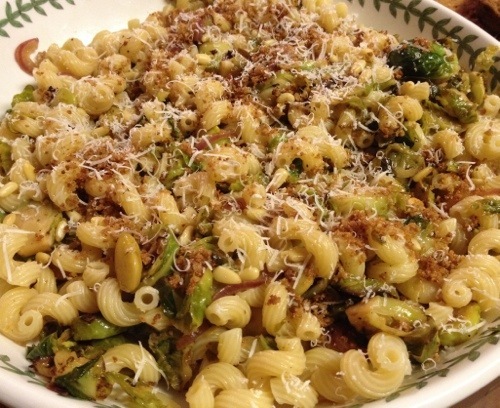 This dish was inspired by a recipe I saw in Cooking Light magazine, Cavatappi with Browned Brussels Sprouts and Buttery Breadcrumbs (November 2012). 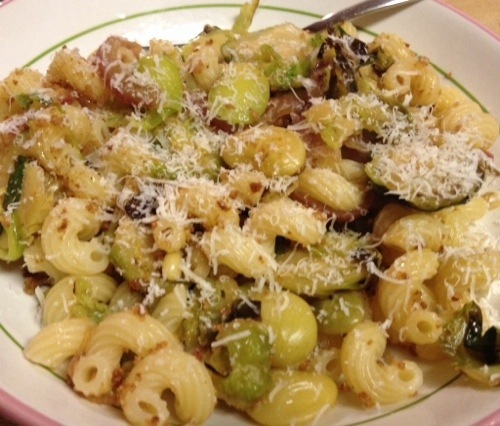 I really like the texture of cavatappi with the Brussels sprouts and lima beans, but other tube-shaped pasta may work well. One last note on this…I made extra and I have to admit that the leftovers tasted even better than the original. So, go ahead, make more than you need! Slice the Brussels sprouts lengthwise into 4 slices each. Set aside. Bring a large pot of water to boil. Cook the pasta according to package directions. Drain and transfer to a large bowl. Keep warm. Meanwhile, melt butter in a small skillet over medium heat, swirl to coat. 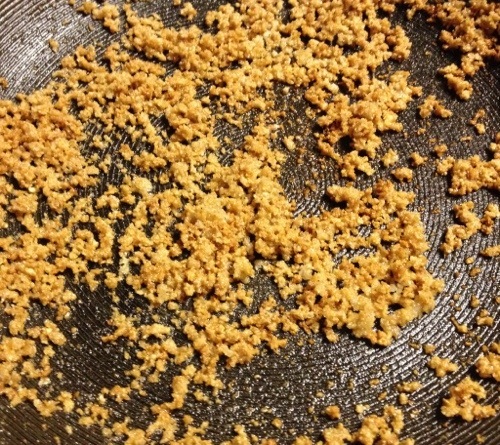 Add breadcrumbs to the pan. Cook, stirring frequently, until browned, about 3 minutes. Heat a large nonstick skillet over medium-high heat. Add oil, swirl to coat. 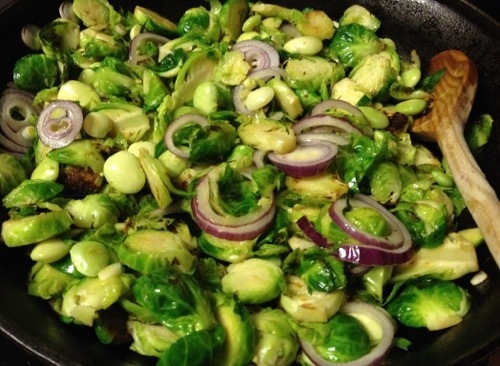 Add Brussels sprouts, cook 3 – 4 minutes, stirring occasionally. 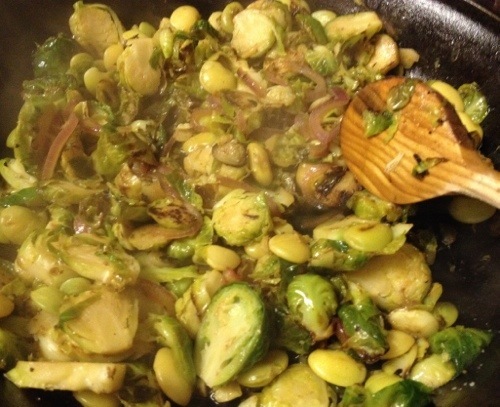 Add onion, garlic and lima beans, cook 2 – 3 minutes, until the Brussels spouts are lightly browned and the onion is tender. Add broth, lemon zest, lemon juice, salt and black pepper. 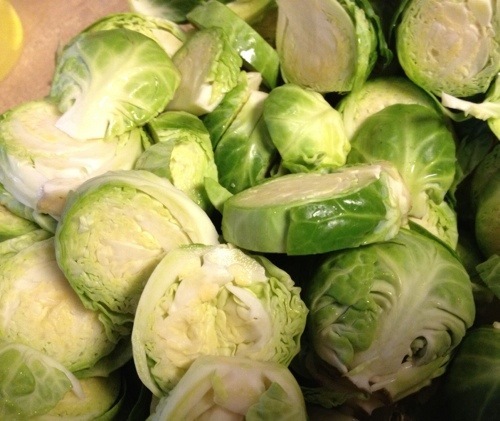 Cover and cook 2 – 4 minutes, until the Brussels sprouts are just tender. Add red pepper. Taste and adjust seasoning. Add vegetables to the pasta, toss well. Top with cheese and bread crumbs.